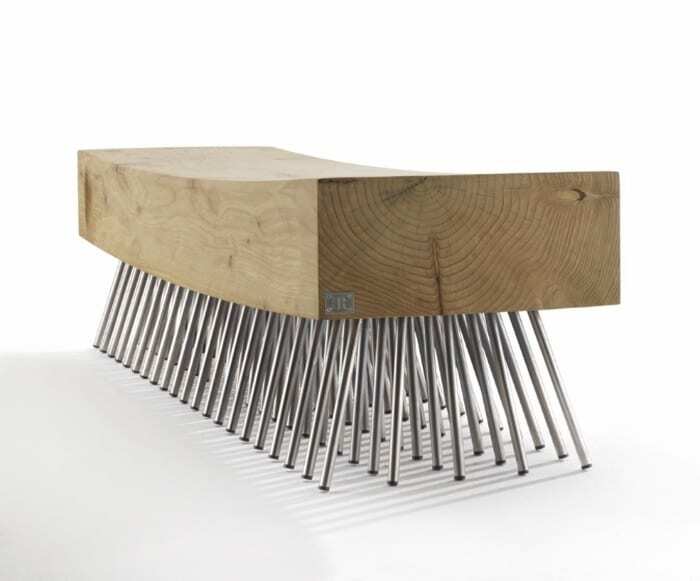 The Spazzola bench is an Italian piece of furniture with a unique design inspired by the shape of a brush with iron bristles. Designed by Italian architect Fabio Lo Jacono for renowned furniture manufacturers, Riva 1920, the bench has been conceived from a single piece of of aromatic cedar wood. A piece of furniture that is hand-finished without the addition of any treatment and that’s giving it agreat visual and tactile appeal. The Spazzola bench seat is slightly concave and ergonomic and it rests on iron struts inclined at various angles. The bench was originally designed for both indoor and outdoor use, offering a comfortable seating all year round. For the Spazzola Bench, movements, cracks and changes in the appearance of the wood are intrinsic characteristics, making it an ideal choice for minimalist interiors, design-conscious landscapes and modern architecture. Intending to meet the specific needs of various customers, these versatile seats are available in a choice of the following finishes: unstained cedar, contrast cedar, sand-blasted cedar and volcano cedar. Fabio Lo Jacono managed to showcase the beauty of natural wood grain, which is specially highlighted by the iron struts. The wood choice was probably made because cedar wood furniture will keep its rich grain and usually stand up to daily use activities. Cedar wood has long been considered the best siding material, because of its outdoor and fire resistance qualities. It is a wood used for centuries, and if maintained a little will probably last a lifetime. Going back to the 1920’s, Riva is one of the oldest furniture manufacturers in the world. With almost one hundred years experience behind, the Italian furniture company has always specialized almost exclusively in the production of classically styled solid wood furniture. The company is now turning their wooden pieces into modern works of art by working with over 100 renowned designers and paying meticulous attention for innovation and research.